Motto Pro Yakyuu Team o Tsukurou! Motto Pro Yakyuu Team o Tsukurou! 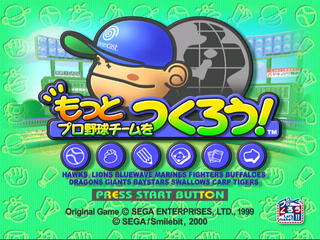 (もっとプロ野球チームをつくろう！) is an entry in Sega's Let's Make series for the Sega Dreamcast. Main article: Motto Pro Yakyuu Team o Tsukurou!/Magazine articles.